You can use this wizard together with an answer file to perform these tasks in unattended mode. The answer file is an ASCII text file that provides automated user input for each page of the Active Directory Domain Services Installation Wizard. Note The <path of the answer file> placeholder represents the path of the answer file that will be used to install or remove AD DS. You must be logged on as a local administrator for the computer to run this command. Fields in the "[DCInstall]" section of the answer file specify the details of the installation or removal operation. The following list provides the common fields that are used for each operation. The default values are used if the option is not specified. The default values for these fields are described in the "Field definitions" section. DatabasePath="<The path of a folder on a local volume>"
LogPath="<The path of a folder on a local volume>"
SYSVOLPath="<The path of a folder on a local volume>"
Password=<The password for the user account> Specify * to prompt the user for credentials during the installation. SiteName=<The name of the AD DS site in which this domain controller will reside> This site must be created in advance in the Dssites.msc snap-in. DomainLevel=<The domain functional level number> This value cannot be less than the current value of the forest functional level. DNSDelegationUserName= <The account that has permissions to create a DNS delegation> The account that is being used to install AD DS may differ from the account in the parent domain that has the permissions that are required to create a DNS delegation. In this case, specify the account that can create the DNS delegation for this parameter. Specify * to prompt the user for credentials during the installation. DNSDelegationPassword= <The password for the account that is specified for DNSDelegationUserName> Specify * to prompt the user for a password during the installation. Password=<The password for the adminstrative account> Specify * to prompt the user for credentials during the installation. DNSDelegationPassword=<The password for the account that is specified for DNSDelegationUserName> Specify * to prompt the user for a password during the installation. This site must be created in advance in the Dssites.msc snap-in. DatabasePath= "<The path of a folder on a local volume>"
Password=<The password for the UserName account> Specify * to prompt the user for credentials during the installation. RemoveApplicationPartitions=If you want to remove the partitions, specify "yes" (no quotation marks) for this entry. If you want to keep the partitions, this entry is optional. Posted by John Ruby in Software, Utilities. EasyBCD is NeoSmart Technologies’ multiple award-winning answer to taking control of your bootloader. EasyBCD extends and revamps the Windows Vista/Windows 7 BCD bootloader, and with EasyBCD, almost anything is possible. Setting up and configuring a dual-boot between Windows 7, Windows Vista, older versions of Windows such as XP & 2003, Linux, Ubuntu, BSD, and Mac OS X is a breeze. You just point & click and EasyBCD does the rest. EasyBCD is free for all private, non-commercial use. For non-private/commercial/for-profit use, please purchase a license from our online store. EasyBCD is geared for users of all kinds. Whether you just want to add an entry to your old XP partition or want to create a duplicate for testing purposes; if you’re interested in debugging the Windows Kernel or septuple-booting your seven test operating systems, EasyBCD is the key. EasyBCD is used and/or recommended by Microsoft, PC-World, PC-Magazine, Softpedia, PC-Welt, Activision, and hundreds more! Don’t get left out – download it today, it’s free!! The process for scheduling Exchange 2010 PowerShell scripts with Windows Task Scheduler is different that what you may be used to in Exchange 2007. This is because Exchange 2010 uses PowerShell remoting for Exchange Management Shell administration. In this post I’ll go over how you can schedule PowerShell scripts for Exchange 2010 tasks. Here are a few things you’ll want to take note of before getting started. Tasks can be scheduled with or without the Exchange tools installed – since all PowerShell management is done via remoting, we can schedule the tasks to run on a workstation, or on an Exchange server. Script signing – as a best practice, you may want to consider signing your scripts. Execution Policy – the PowerShell execution policy is set to remotesigned automatically when you install Exchange. You may need to set your execution policy if you’ll be scheduling tasks to run from a machine without the Exchange tools installed. C:\Windows\System32\WindowsPowerShell\v1.0\powershell.exe -command ". ‘C:\Program Files\Microsoft\Exchange Server\V14\bin\RemoteExchange.ps1’; Connect-ExchangeServer -auto; c:\Scripts\MoveMailboxes.ps1"
C:\Windows\System32\WindowsPowerShell\v1.0\powershell.exe -command ". ‘C:\Program Files\Microsoft\Exchange Server\V14\bin\RemoteExchange.ps1’; Connect-ExchangeServer -auto; Get-Mailbox -Database DAGDB1 | New-MoveRequest -TargetDatabase DAGDB2"
These examples assume you used the default installation path for Exchange 2010; you may need to modify these commands to match your configuration. C:\Windows\System32\WindowsPowerShell\v1.0\powershell.exe -command "$s = New-PSSession -ConfigurationName Microsoft.Exchange -ConnectionUri http://fab-ex2.fabrikam.local/PowerShell/ -Authentication Kerberos ; Import-PSSession $s ; Get-Mailbox -Database DB1 | New-MoveRequest -TargetDatabase DB2"
This is very similar to the previous example as we specify all of our code within the command parameter. This time we create a new PSSession, import the PSSession, and then perform the mailbox move. Now that we’ve got the syntax figured out, we’re ready to schedule a PowerShell task using the Windows Task Scheduler. In this example we’ll schedule a task to do a mailbox move after hours, we’ll do this from the Exchange server. First, start the task scheduler and create a new basic task. Give your task a name, in this example we’ll name it "Move Mailbox", click next. In this example, we are just scheduling a mailbox move, so we’ll choose "One time". If you have a script that needs to run daily then adjust the schedule accordingly. Select the date and time you want to run the script and click next. Select "Start a program" and click next. Now paste the entire command into the "Program/Script" field and click next. The task scheduler will ask if you want to run PowerShell.exe with the arguments specified. Verify that the syntax is correct and click yes. That will bring you to the last screen, click finish. There you go, you now have an Exchange PowerShell task scheduled to run. If you have User Account Control (UAC) enabled, you may need to enable the option to Run with highest privileges in the properties of the scheduled task. Also, you will probably want to enable the option to Run whether user is logged on or not in the properties of the scheduled task. 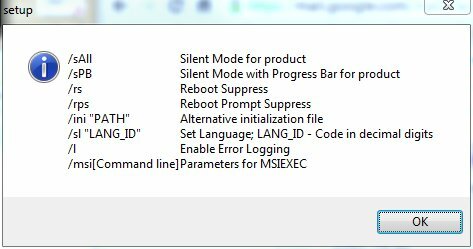 This command installs Acrobat Reader X in silent mode and rebooting after installation is suppressed. Because a Server Core installation does not include the Windows user interface, there is no "out-of-box experience" to help you complete the server configuration. Instead you must manually complete the configuration using the command-line tools as outlined in the following steps. You can also configure certain aspects using the Server Configuration tool. To use the tool, see Configuring a Server Core installation of Windows Server 2008 R2 with Sconfig.cmd. You can use an unattended setup to configure these settings during installation. For more information about unattended settings, see the Windows Automated Installation Kit (Windows AIK) (http://go.microsoft.com/fwlink/?LinkId=81030). If you are going to join a server running a Server Core installation to an existing Windows domain, you need a user name and password for an account that has the administrative credentials to join a computer to the domain. If you close all command prompts, you will have no way to manage the Server Core installation. To recover, you can press CTRL+ALT+DELETE, click Start Task Manager, click File, click Run, and type cmd.exe. Alternatively, you can log off and log back on again. Because there is no Web browser, you cannot activate a Server Core installation or access the Internet through a firewall that requires users to log on. A DHCP address is provided by default. You should perform this procedure only if you need to set a static IP address. When your computer starts for the first time after the installation completes, press CTRL+ALT+DELETE. Type Administrator for the user name and leave the password blank. The system will inform you that the password has expired and will prompt you to enter a new password. When your computer starts for the first time after the installation completes, the system will inform you that the user’s password must be changed before logging on for the first time. Click OK. The system will prompt you to enter a password.